Prepare the stretchers referring to the cutting list, then rabbet their ends to make the tenons. The top stretcher tenon should be 114 inches long to end flush with the legs, while the lower one must be 4 inches long to allow it to hold a tusk pin. 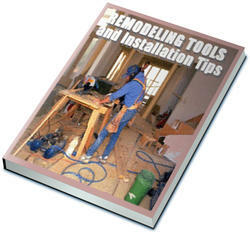 To cut the rabbets, install a dado cutting assembly in your table saw and attach a miter gauge extension. Adjust the cutting height to about Yt inch and make a cut in both sides of a piece of scrap stock and test the fit in the open mortise. Fine tune the height until the test tenon fits snugly. Set the rip fence to make a 1'/-inch-long tenon. 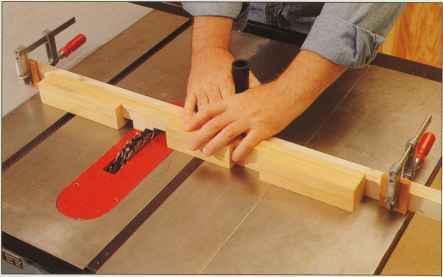 To cut the tenon, hold the stock against the miter gauge extension with an end butted against the fence. Pass the wood over the cutters, then remove the rest of the waste by moving the workpiece away from the fence in successive passes. Repeat for the other side and the opposite end. Next, raise the cutters to Vz inch, hold the stretcher on its lower edge, and cut a notch to allow the stretcher to fit flush with the top of the legs. Reset the fence to make a 4-inch-long tenon and make the cut in the lower stretcher (right). Then saw a Yt-inch notch in the top and bottom edges to allow the piece to fit into the mortise.